One, two, three, four, one, two, three, four… I count my pedal strokes methodically as I pick up my pace and close the gap to the cyclists ahead. It's hot and humid and sweat beads form on my brow and trickle down my dewy face. I don't really care too much about the temperature any more. Cambodia is warm to hot for the most of the year and you quickly get used to it. And even if you don't, you soon forget about the heat because the surroundings are astounding. I'm on a cycling tour with SpiceRoads Cycle Tours. We're guided by a clever and entertaining leader, we're using brand new Trek X-Caliber 7 bikes, and our support vehicle is never too far away. The van becomes a little portable haven for us. Whenever we break in picturesque shady spots, we eat cold fruits, local snacks and use way too many wet towels to relieve us from the heat. On tour with Spice Roads. You've got to be a certain kind of person to go on a cycling holiday. For starters, you need to like cycling or at least be open to the idea of sore buttocks and aching calves. A reasonable level of fitness is advisable. A little commonsense goes a long way too. As a cycling holiday novice (but not a rookie cyclist) I had my expectations. I pictured leisurely pedalling past undulating hills of luscious greens and sun-kissed yellows, waving at giggly half-dressed children with sticky mouths and fingers, and stopping regularly for tea and sweets (it's a holiday, not a race, after all). Cycling for three consecutive days and returning to the same hotel each night (personal choice hotel and not included as part of the tour) was the perfect choice. No repacking, no drawn-out dinners, a short commitment, and the option to pike out at any time (thanks to the trusty support van). Win. Starting in different areas of Siem Reap each morning, the three-day 126-kilometre Angkor Explorer expedition is designed to take in the best of Angkor Wat and the surrounding temples, as well as other Cambodian sights – a scenic boat ride through a floating village, a picturesque pedal along a countryside road that's unnamed on Google maps, a trek to a mountaintop where we see hundreds of carvings etched into the riverbed. We're a team of just five – guide Rous, SpiceRoads team member Ethan, adventure-loving German couple Axel and Julia, and me. For the most part, the five of us cycle at comparable speeds. Rous always leads the way, Axel typically follows closely behind (he tells me that he cycles 40 kilometres to work and back most days), then it's Julia, myself, and finally Ethan tailgating our spirited yet motley crew. Our pace is almost always unhurried (we tend to amp it up when lunch gets closer) with plenty of opportunities to stop for water, photos and snacks – and temples, obviously. The stops are what make this tour. It's a three-day exploration of the Khmer empire and segments of the Angkor Archaeological Park – an area that spans 400 square kilometres and is home to hundreds of temple ruins. Although Angkor Wat is the bee's knees of the historical vastness, Rous explains that it's best visited (and photographed) in the afternoon light and leads us to one of his favourite temples first. We reach Ta Phrom​ by cycling along a somewhat challenging jungle track – a fitting route given the luscious surrounds of the temple. The grounds look like they could belong in a movie set… and they did (some of the most memorable scenes from Lara Croft: Tomb Raider were filmed here). Ta Phrom is serene and made all the more beautiful by its unkempt and overgrown state. Banyan, kapok and fig trees spread their colossal branches over temple remains, knitting an intricate and exquisitely beautiful canopy. The gigantic roots of these magnificent trees tightly coil around remnants of stonewalls. It's magical and surreal and absolutely stunning. 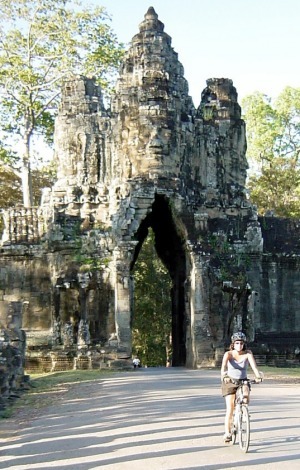 A visit to Bayon, one of the most popular temples in the vicinity, follows. The giant stone faces of Bayon are some of the most talked about features of Khmer art and we spend more than an hour examining them. Here Rous points out a huge smiling stone face. "It's our Mona Lisa," he laughs. "Why go to France?" We wander around awed and inspired for a little longer, then jump back in the saddle. And do we move – Angkor Wat is next. The massive, mind-blowing centrepiece of Angkor Archaeological Park is everything it claims to be. The largest religious monument in the world takes us a few hours to explore (and gives our bums a rest from the bike seats). Five towers that appear to leap into the sky crown the sprawling complex and almost any way you look the remains are adorned with sophisticated carvings. We forget about the bikes, the heat and our exhaustion and soak up one of the world's greatest wonders. Although day one is the expected highlight, I enjoy the other days when we visit lesser known sights. On day two, the Hindi temple Banteay Srei​ stands out for its strikingly complex carvings – elaborate leaf motifs and female deities that Rous explains are known as devatas. Banteay Srei is constructed from rose sandstone and it looks particularly stunning early morning or late afternoon when the sun's rays flicker a gentle, dappled light which accentuates the pink colouring. According to Rous Banteay Srei was built by women – a hypothesis because of the placement heights of the stones. Rous is full of fun and quirky facts. He tells us stories about ancient lands, delves into historical analysis and talks about cycling frequently (obviously his passion) as we skirt luscious green fields and pedal through sleepy villages. We learn that Rous spent four years living in a monastery as a young adult after moving to Siem Reap in his early twenties as he didn't know anyone else there. In Cambodia there are thousands of monasteries and many of them provide lodging for those in need (customarily those staying on-site work at the monasteries). Like temples were once places of worship for ancient Khmers, Rous explains that today monasteries are perceived to be like modern-day temples in Cambodia – places to come together and worship. This meaningful spirit of community is carried through day-to-day life and it's not uncommon to see congregations of monks draped in orange shawls ambling alongside flocks of Cambodians, chatting. We pedal past life and stop when we want, relishing the immersion that travelling by bike brings. To get to the start of a boat cruise through the floating village of Kampong Phluk​ we cycle to the boat ramp along a dusty road that feels a lot longer than the eight kilometres Rous claims it to be, and on arrival notice that the river is very shallow. The tattered boat frequently splutters, periodically stops and very sporadically glides along. We pass hundreds of homes raised on stilts in the muddy riverbanks and watch village life unfold around us. Mud-caked kids scuttle up and down steep stairs, human washing machines launder clothing in the river and others fish… or sleep. The people of Kampong Phluk go about their daily lives but still look up and smile that open-hearted Cambodian smile at us. It's the same when we cycle through villages. People stop and look up with a simple or a fleeting smile. 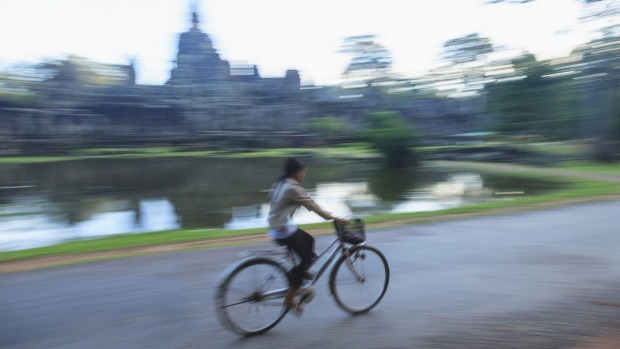 Although travelling by bike is sticker and sweatier than being transported from point A to point B in airconditioned luxury, it's also a way to get closer to the people – and that's the real Cambodia. 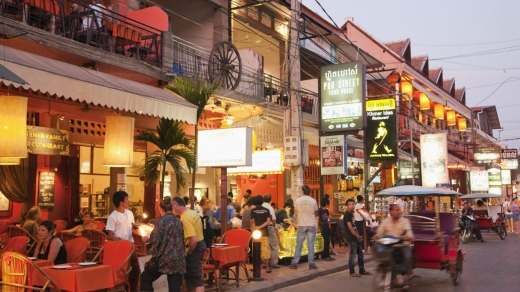 Pub Street is Siem Reap's party hub, so grab a drink, order fish amok (a sweet Cambodian coconut curry) and settle in for a fun night. The interactive, theatrical spectacle is executed by exceptionally talented Cambodian youth. It's comparable to Cirque du Soleil… and a whole lot cheaper. See pharecambodiancircus.org. Float into the sky and see the magnificence of the ancient Khmer empire from up high. Flights are timetabled for sunrise and sunset. See angkorballooning.com. Once you sample amok, you'll want to recreate it at home. Siem Reap has no shortage of Cambodian cooking schools and most chefs focus on market visits, the use of fresh herbs and plenty of food at the end of it all. Legs sore after cycling? There are a plethora of massage parlours dotted around Siem Reap and many have seats fronting the street so you can sit and watch the world go by while you get a foot rub. Emirates flies from Sydney and Melbourne to Bangkok. From there Bangkok Airways connects to Siem Reap. See emirates.com and bangkokair.com. The Frangipani Villa Hotel is a charming hotel with comfortable rooms, a good breakfast and friendly staff. It's just a short stroll away from the action of Pub Street too. See frangipanihotelangkor.com. The writer travelled as a guest of SpiceRoads Cycle Tours.